We woke up this morning with high hopes for the day. 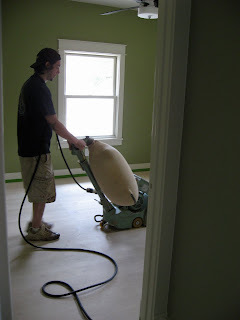 Although we're still dealing with HVAC troubles, we've figured out a workable plan, and the wood floors would be finished by the end of the day. We were going to get started on a big project involving bridging the gap between the old driveway and the house (about ten feet -- just a temporary fix until we figure out how we want to go about replacing the whole driveway). We were going to go to our appliance shop to order a refrigerator during Texas's sales tax holiday for Energy Star appliances (which I'm philosophically opposed to, but as long as it exists, we'd be fools not to take advantage of it). In short, lots to do. When I woke up this morning and went to feed the bunnies, though, our plan fell apart. Dash wasn't interested in food and was obviously really sick. Our usual vet is out of town for the holiday weekend, as is his partner and, as it turned out, the vet their office referred us to. We finally found a vet qualified to handle bunnies and drove straight there. We don't really know what's wrong with him, but we suspect that it's related to a ton of goo that built up in his ears since they were cleaned just two weeks ago. (We'll know more Wednesday, when the ear-goo culture comes back.) For now, he has ear antibiotics, oral antibiotics, and Millie faithfully by his side. She wrapped an ear around him 'cause that's sure to cure what ails. Anyway, we spent the not-totally-unbearably-hot hours of the day at the vet and setting Dash up with his medicine and his sick-bunny food, and by the time we finished up at the appliance shop (we did get the refrigerator ordered -- at a savings of almost $150! ), it was noon and way too hot for outside chores. With the wood being finished today (at least that is getting done), we can't do inside chores, either. Instead, we're laying low, watching tennis on TV and staying close to Dash -- who, in case we haven't mentioned it recently, we love so, so much. This picture pretty much speaks for itself -- and this is just the sealer coat! The finish coats will go on tomorrow. It was a bit of a shock to see the color come out of the wood, after looking at a dull (albeit beautiful) surface for a couple of months. This is the first time I've really grasped what a huge feature the wood floor is -- yesterday, the house still seemed to be a long way from complete; today, with the floor starting to look finished, it looks so close -- the floor tipped the balance from "glass half empty" to "glass half full." 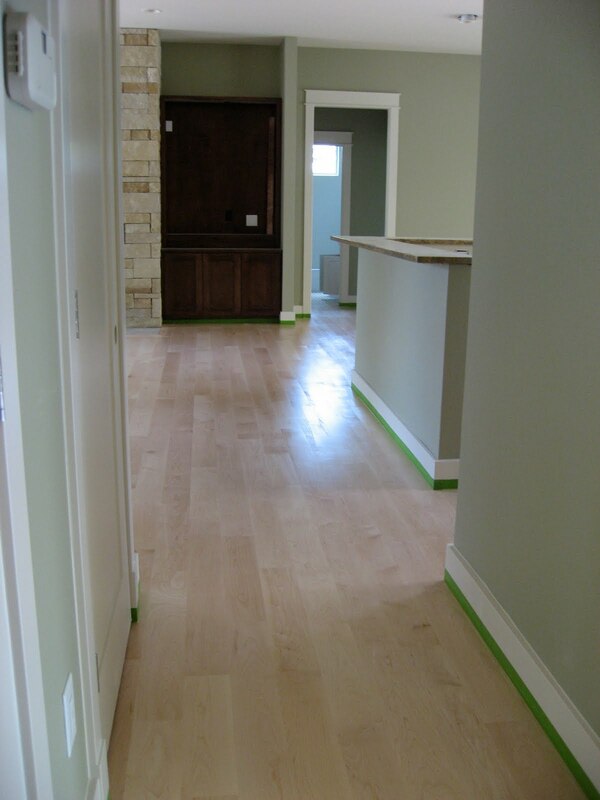 (In this picture, the green tape on the baseboards is just about the only thing that's not in final condition. 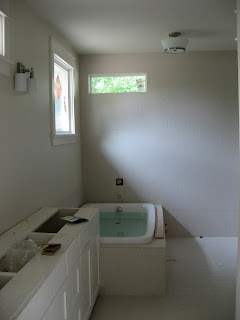 Of course, what you can't see is the absence of appliances, the drywall repair and paint touch-ups that need to be done, the plumbing that isn't connected to anything, the back bath light that's hardwired on,...). 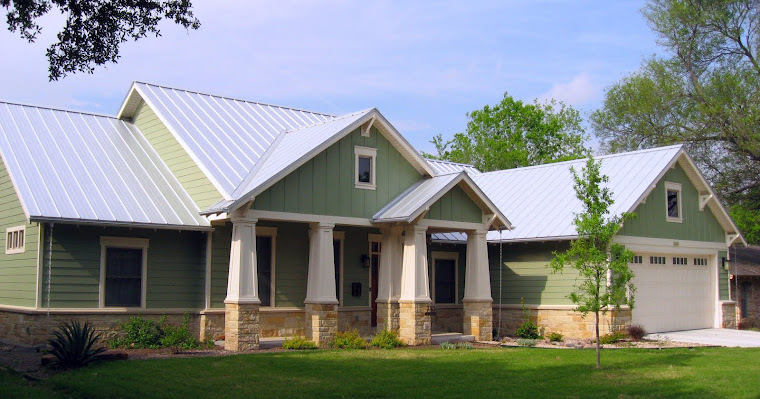 And before you take those blue booties off of your shoes, I wanted to let Austin-area readers know about the Cool House Tour coming up next Sunday (June 6) all around town. It's a great event that showcases green homes (12 of 'em this year), introducing the public to all kinds of energy-efficiency features that can be included in new construction and, in many cases, incorporated into older homes as well. We attended last year's and got lots of good ideas for our house. This year the tour will have a somewhat different focus for us -- landscaping (not necessarily a feature that the organizers will be highlighting, but green homes tend to have native, drought-tolerant landscaping that should be right up our alley) as well as considering the tour from the homeowners' perspective, in preparation for possibly applying to next year's tour. With the floor guys hard at work and no one else really being able to get into the house to work, I expected to have lots of time this week for catch-up posts about things like the water heater. However, part of what's nifty about the water heater is that it's powered in part by the heating/air conditioning system, and the air conditioning has been malfunctioning all week (with the miraculous exception of Tuesday, when it worked for the entire day). Not good for controlling the moisture level in the floor (critical to a good finishing job), and not good for our confidence in the very pricey geothermal heat pump system or the company that installed it. And because of these troubles, I just don't think it's the right time to share the details of the HVAC/water heater/on-demand recirculating pump extravaganza that is supposed to revolutionize our household consumption of both energy and water. I got some kind of rash a couple of weeks ago (it seemed like spider bites, but they kept growing and multiplying and ITCHING). Yesterday I finally saw my doctor, who immediately sent me to the on-staff dermatologist (local plug: Austin Regional Clinic is fantastic!). Dr. Viernes turned out to be a very serious Asian man who, after examining my legs with his magnifying goggle apparatus, told me that I had what he and his colleagues refer to as as "outside job" -- a reaction to some kind of external irritant. We've had some outside jobs recently, too. In addition to the Great Tree Cutting of 2010, the gutters went up last week. 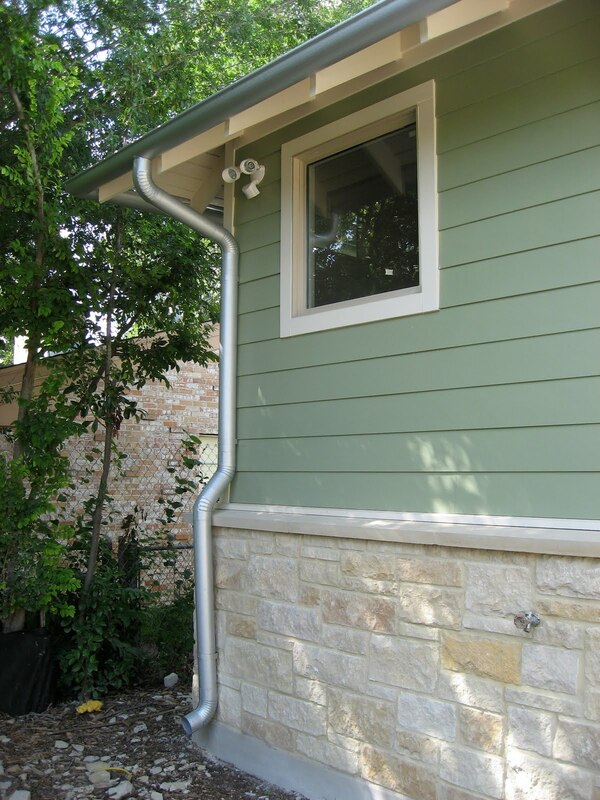 They're Galvalume (galvanized steel) to match the roof, and they're bigger and rounder than typical gutters to show off the exposed rafter tails (which you can see poking out below the gutter in this picture). We asked for just two downspouts, one on each back corner...but this one ended up in the totally wrong place (it has since been relocated here) and the other was on the right corner but facing the wrong way, so it was moved (sort of). Again, the waste of doing it wrong, coming back to do it right, and then fixing the evidence (holes in the mortar, scratched paint, etc.) of having done it wrong. Anyway, our plan is to use rain barrels (possibly even a big cistern) to collect the rain from the two gutters (which are, conveniently, on the longest lengths of gutter) and rain chains (like these...most likely the cup style) to channel the rest of the rain down into dry creek bed-like areas that will direct it away from the house. We've been putting off those purchases, but now that the gutters are up, we really should get moving on that. Another outside job involved the steps from the (to-be-) screened porch to the backyard. 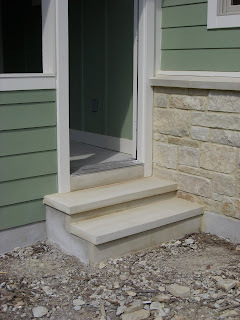 After tearing up the concrete steps, the stone mason used some of the stone cap material along with some thicker, wider material to even out the height of the steps and put a classy touch on them. We'd like to install a paver patio out back, and these steps make a much nicer approach, so while we're not too sure what happened to bring this about, we're pretty happy about it. Frankly, I don't know what's so special about Toto toilets. The Eco-Drake is low-flow (1.28 gallons per flush), earning it the EPA's WaterSense designation, but a lot of toilets are low-flow. All I know is that they're designed in such a way that we should never have to worry about clogging (I think the pipe that everything travels through is wider than most toilets). 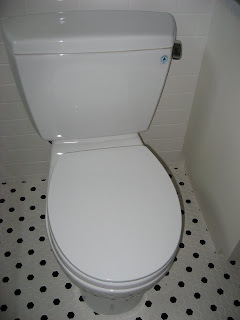 We were originally planning to use a different brand and to go the dual-flush route (.9 gallon for lighter jobs, and 1.6 gallons for bigger jobs), but someone told us the .9 gallon setting wasn't very good at flushing anything. We tried some out at a couple of model homes, and our experience wasn't good. Then we started thinking about a particular Kohler low-flow model, but the online reviews were mixed. After both the head accountant at my office and one of my bankruptcy lawyers suggested Toto, I searched the reviews. (No, we're not bankrupt, but people I deal with at my job often are.) The only bad thing I read about these toilets was that some weirdo was unhappy that they didn't handle Q-tips like his old toilet did. Once we decided to go with Toto, selecting a model was easy. These toilets aren't cheap, and the Eco Drake was the least expensive WaterSense option...by a lot. 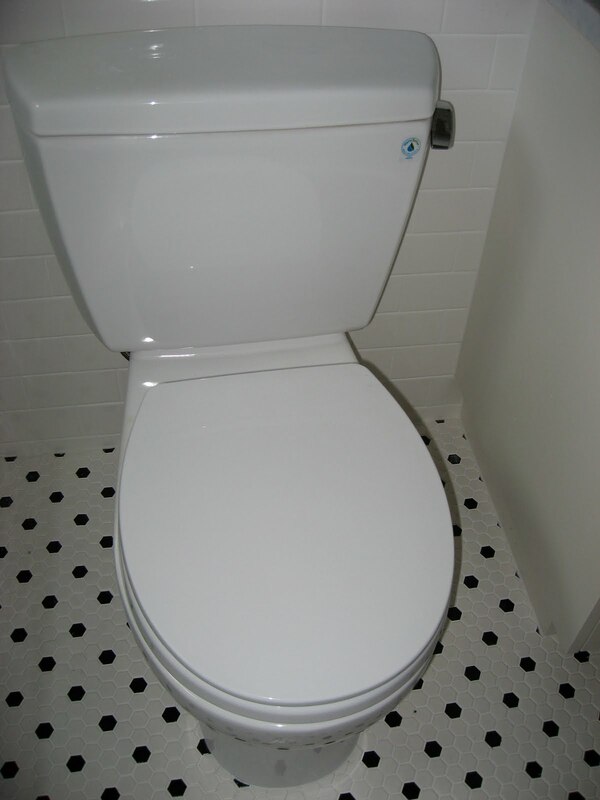 We did, of course, further complicate the decision by laboring over elongated versus round and ADA-height versus regular bowls, and we realized that all of our toilets are approached from the right, so we ordered them with the flush lever on the right. Apart from the lever being on the other side, the innards of a Toto aren't so different from any other toilet. 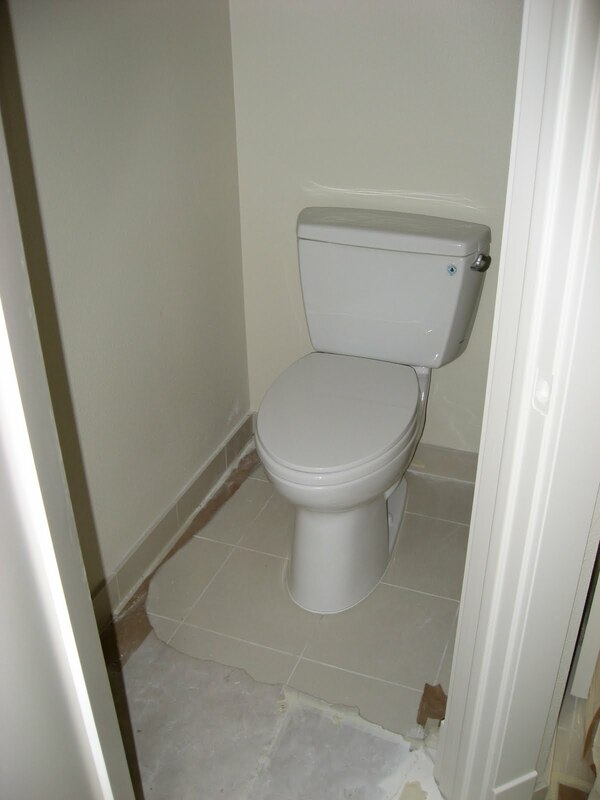 Here is the master toilet, in its own room. 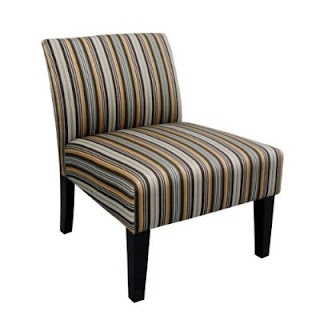 This one is elongated and ADA-height (two inches taller than normal, I think). The other neat feature about Toto is that they have an option for a slow-close lid (which -- let's be realistic -- you can't not get). If you're tired of your partner's midnight trips to the potty waking you up with the sound of the lid slamming down, you'll love the slow-close. Or, as the Toto website says, "SoftClose action reduces injury and eliminates 'toilet seat slam.'" Can't beat that. Edit: Austin folks -- the city has brought back their free low-flow toilet program. Info here. I'm not familiar with the brand, but if you have a pre-1996 toilet, it's worth checking out. I can't believe how much it's looking like a real house. Almost like somewhere a person could live. With another person and two bunnies. It's because of all of the cosmetic progress that I haven't yet had an opportunity to write the long-promised water heater post or the sure-to-thrill toilet post. Patience, dear reader. We chose a white grout to hopefully make the off-white tile look less white (a trick I picked up from the kitchen in Brothers and Sisters). I think it worked. The window trim also helps. 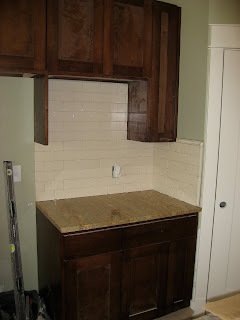 There was a little bit of a crisis Friday evening when I discovered that the backsplash at the bar wasn't quite two tiles high -- I assumed it was 6" tall, so two 3" tall tiles would fit perfectly, but it was 6" before the granite went in, so we had to cut 1-1/4" off. I couldn't decide, though, whether to cut the full amount off of the top tile or 5/8" off of each. The installer made me a mock-up of the 5/8" option, and it was almost impossible to tell that they were cut down. In these pictures, the camera angle makes the difference more pronounced than it really is. Oh yes, and the observant reader may have noticed that the bar granite also went in today. Meanwhile, the observant homeowner (me) finally noticed that the althea plant at the corner of the house has sprouted lovely lavender flowers. The arborist we met with last summer identified this bush and told us that it would have hibiscus-like flowers, so I hauled milk jugs of water over to keep it alive during our drought -- and now, nearly a year later, it's paying off. I never thought I'd be so happy to be extorted. Dave Letterman sure didn't make it seem like fun. In our case, it was the city demanding that we put in a sidewalk on our property. We applied for a waiver, but they said no (extortionists aren't really know for their reasonableness). The sidewalk was going to cost almost $3,000...which might make some sense if it actually served a purpose, but in our case (with none of our neighbors having sidewalks) it would be a useless Sidewalk to Nowhere. We had the option to buy our way out of this requirement, but at $50/linear foot for a 62' long sidewalk, that was going to cost even more than putting in the sidewalk. Eventually, though, we got so frustrated with the challenges the sidewalk would present (how to get it installed in time, what to do with the little strip of yard between the sidewalk and the street, etc.) that we decided to explore the sidewalk waiver further. So glad we did -- since R's last job they've brought the cost down to $30/linear foot, or about $1860. I never expected that being scammed out of almost $2,000 would feel so good, yet I was thrilled to write that check to the city last week. One step closer to moving in! Here are a couple of new pictures. The office fan has been up for a while, but the plastic wrapping just came off, so I was finally able to get a good picture of it. I liked this fan because it reminded me of a '50s office (not unlike the exercise room fan, which reminded me of an old-school gym). The main light is at the bottom, but the round white part above the fan also lights up as an accent. See below for today's other post, as well as a big (?) announcement and request for input. 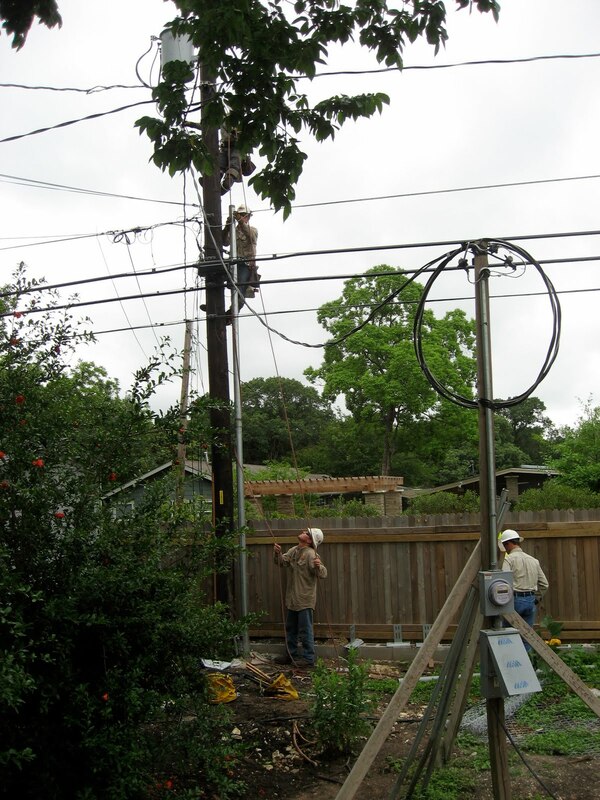 Last Wednesday, the house passed an electrical inspection, so R called in the request for our electrical meter. We were told it would be installed within 3-5 days (R said they usually go in sooner than that). But then Steve noticed a note in our electrical permit record that looked like there was a problem. Apparently Austin Energy specifically told R not to check on the status until five days had passed, and he didn't want to risk getting on the Austin Energy folks' bad side by inquiring about it before today. Steve and I, not concerned about "the next job," jumped right on it and started making phone calls. 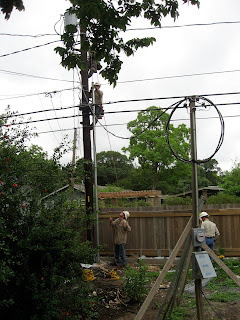 Long story short, I spent a ridiculous amount of time yesterday talking with a ridiculous number of ridiculous people at Austin Energy until they finally got to the bottom of their communication lapses and agreed to send someone over first thing this morning to finish the infrastructure for our underground service, install the meter, and "energize." See the guy up on the pole? There's another guy above him (mostly blocked by the tree), and they're hooking up our service. ...until he ran out of "good" stones and had to stop to get more. Not too shabby for a single day. 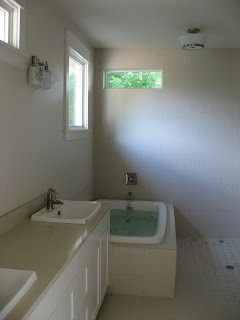 Tomorrow: HVAC, remaining tile work (kitchen backsplash, front bath finish-up, etc. ), and hopefully the behind-the-scenes plumbing work (I don't think everything I showed you above is actually functional quite yet). Every day I stop by the house full of hope for what might have happened that day. The last two days have been a huge disappointment in that respect, as virtually nothing was done. Today, though, progress came at me from every angle as soon as I opened the door. 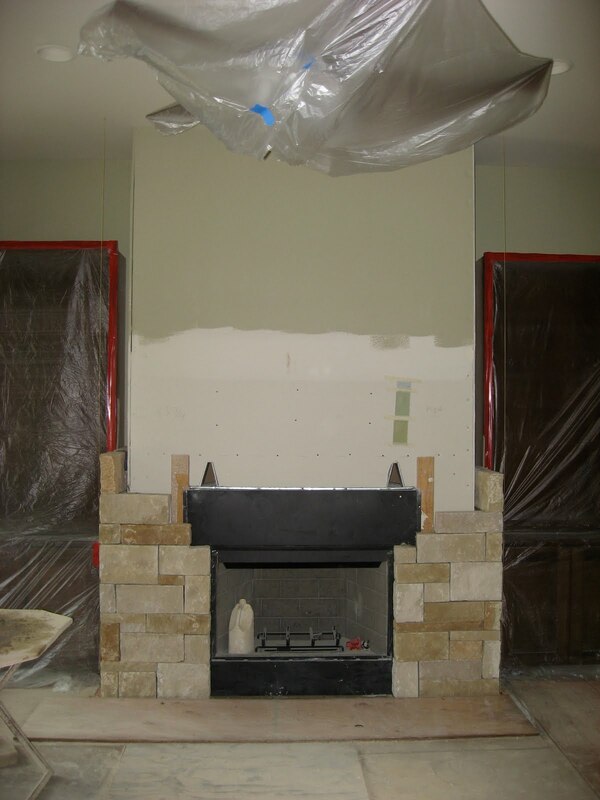 To the left, the stone masons started working on the fireplace. This is the same stone as on the exterior, but it is being laid in a "mortarless" configuration. 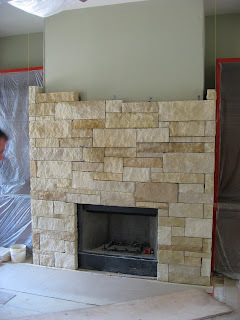 We would have preferred this look for the whole house, but it was unbelievably expensive just to do it on the fireplace, and I can't imagine what the upcharge would have been for the entire exterior. 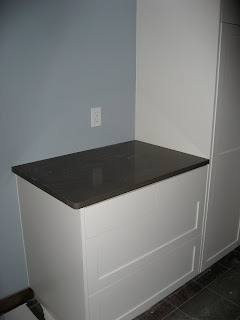 Straight ahead of me, the granite was installed in the kitchen. 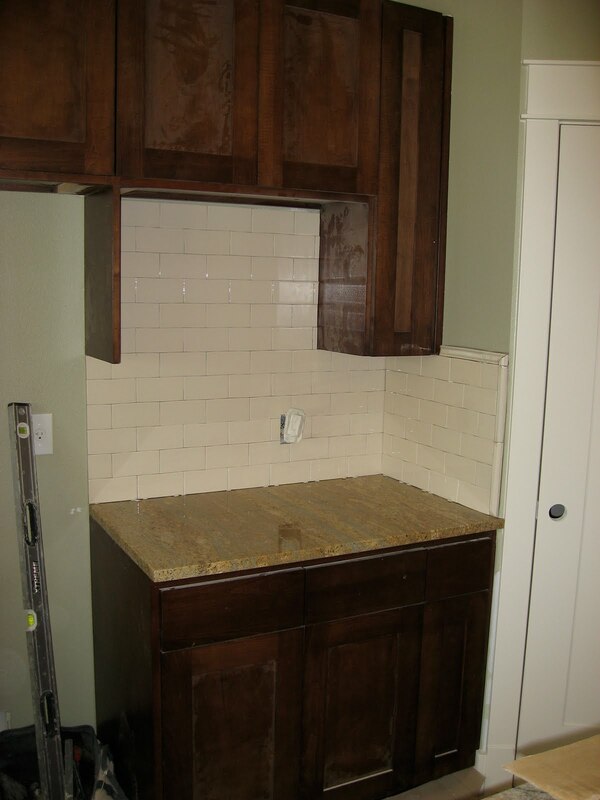 As you can see we're still waiting on the bar granite. I took a bunch of pictures of the whole kitchen, but the counters were still dusty, so I'll have to follow up with a whole-kitchen picture later. Hopefully the cabinets will be dust-free then, too...so that will have to wait until after the wood floor is finished. The poppy door (and its transom and sidelight co-parts) finally arrived! We can't wait for them to be installed so we can look at it as we approach the house every day. Of course, we'll rarely use this door. Instead, we'll enter the house through Thing I'm Looking Forward To #7: a garage with a door that opens automatically, as if by magic. At some point, the house is going to be finished, we will be moved in and unpacked, and our lives will go back to normal. We will still have lots to blog about related to the house, including landscaping, installing the speakers for which we pre-wired, decorating, and (we hope) our unbelievably low utility bills, but I imagine this blog will also become about the little things that make up life at Casa B. -- things like the bunnies, the food we make in our new kitchen, and our swim/bike/run habit. So...given that a whole lot of nothing went on at the house today, I decided to share what I did with my evening. I competed in a race involving a half-mile swim in the lake at my gym followed by a 2-mile run on the gravel trail around the lake. Because so much of our time over the last year has been devoted to the house, I'm not nearly as fast as I was a year ago (in the water or on foot -- or on a bike, for that matter), but it's great to be back out there. Today, however, I forgot to transfer my goggles from my gym bag to my triathlon bag, and the goggles someone loaned me didn't fit my eyes at all. Within a dozen strokes, they were full of water, and I knew adjusting them wouldn't really fix the problem, so I made a strategic decision to swim without them. I stopped swimming for a second, took off the goggles, stuffed them in my tri suit, and kept swimming, not sure what it would be like or whether that was a huge mistake. Surprisingly, it was, in many ways, easier than swimming with goggles. Since there's no chlorine in the lake, the water didn't hurt my eyes (although they do feel a little funny now, three hours later). It was actually easier to sight to the buoys without goggles (which tend to fog and limit my vision), and the blurriness underwater didn't matter because there wasn't much to see below the surface. I was even able to find someone swimming my pace to draft behind, although she had a wild kick that my hands bumped into on almost every stroke. My swim wasn't great, but I can't attribute that to the goggle situation. In fact, if I ever forget my goggles again (which is sure to happen at some point), I won't even try to borrow any. Both my swim and my run were still slow, but hopefully I'm getting back into the swing of things. I think the biggest thing I need to focus on now is eating better. All that training requires a lot of fuel, and our current kitchen doesn't really inspire me to make healthy, balanced meals. Have I mentioned that we were already supposed to have moved into our new kitchen? R has drawn about 85% of our construction loan funds (not to mention the cash we gave him directly for the heat pump and other upgrades we've made since we started), and the house is definitely looking like it's close to completion (although not as close as we'd like -- the original schedule would have had us moving in this past weekend). In the interest of full disclosure, they're from Target, so the stimulus value of this purchase was minimal...but that just leaves more for us to stimulate elsewhere...which is good because we also recently stimulated the Hawaii economy a good bit with the purchase of a koa console table. Unfortunately, it's packed away in the box it arrived in, so I can't post a picture. Also packed away? Thing I'm Looking Forward to #6 (and this is a big one): The Christmas morning-like extravaganza of unearthing all of our stuff that's been in boxes for at least a year now. I would estimate that about two-thirds of our stuff is packed away in a spare room. You might say that, if we haven't needed it in this time, we don't really need it, but you're wrong. I long for it every day. I miss my stuff. If that makes me materialistic, so be it. We have good stuff and can't wait for it to be back in our lives. Thing I'm Looking Forward To #6: Walking compost out to the pile. I'm tired of having to save it up until I drive over. Today marks one year since we signed the contract to buy the lot. We were hoping to be in within a year, but I'd say we've come a long way nevertheless. 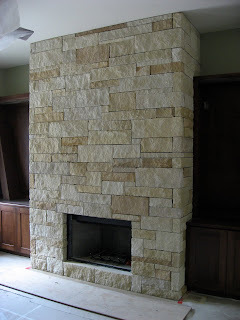 It's Zodiaq, not natural stone. Although we were warned that solid surface counters were a mistake (we ignored a lot of advice...), we liked the idea of a solid surface for what is sure to be the hardest-working counter in the house. It actually has more of a natural pattern than I had remembered, and it coordinates unbelievably well with the tile (also a synthetic material -- porcelain -- that looks like stone). 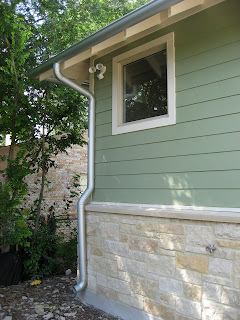 There's no light in the mudroom -- oh, how I wish we had put a solar tube in there! -- so it's hard to see until the electricity is turned on, but this dark bluish-brownish counter is just the right look with the varied slate. 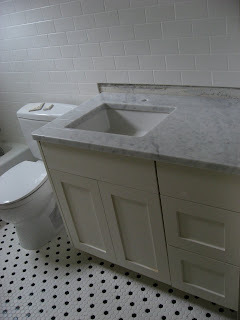 This one is the real deal -- vyara granite. We bought it as a remnant (like the other pieces that arrived today, as well as the other bathroom counters) and later found the main kitchen material, which is a totally different granite (kashmir gold) but that has the same blue-grey streaks. We can't wait to see it go in! And now for Thing I'm Looking Forward To #3: our new pantry. Not just because it's big (which it kind of is), but because we don't have any pantry at all right now. 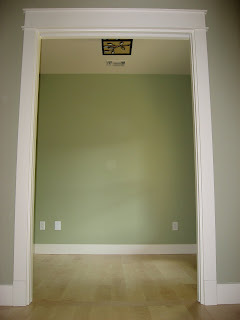 All we have is what we've taken to calling the "scary closet" -- which, as Thing I'm Not Going To Miss #4, we don't dare trust to hold our food. Thing I'm Not Going to Miss #2: A furnace that sounds like a freight train. (Freight trains actually go by two blocks from the temporary house. We can't hear them when the furnace is on.) Of course, now that it's about 150 degrees out, we're already happily not missing the furnace...but we look forward to the new HVAC (heating, ventilation, and air conditioning) system nevertheless. 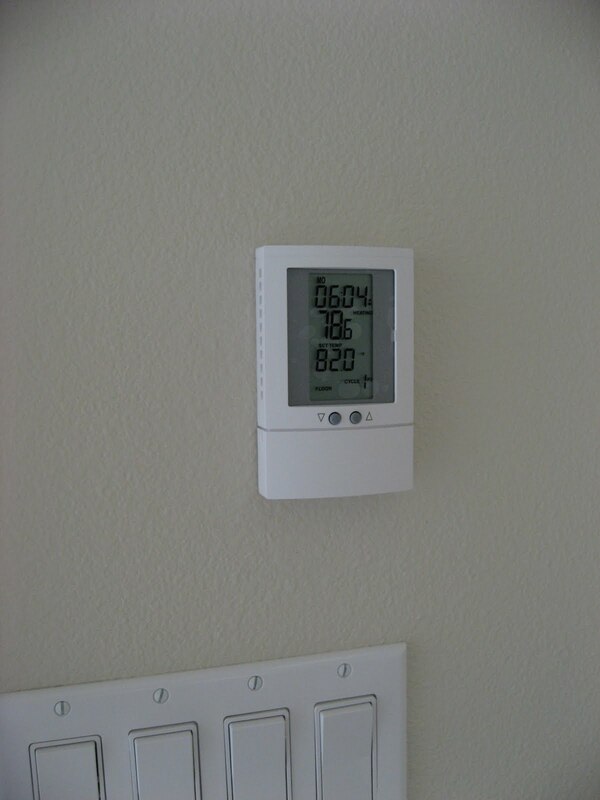 The main thermostat has most of the controls for the system (including humidity, which will allow us to make the house more comfortable without actually changing the temperature). However, this thermostat only sets the temperature for one zone (the master and the bunny room, and maybe the mudroom...don't remember). The satellites control the temperature for the other two zones -- great room (including kitchen and dining) and possibly mudroom, and the bedroom wing. This will allow us to keep the bunny room cool during the day without having to air condition the entire house, and it will also let us save power in the bedroom wing when we're not using those rooms. Not much to show today -- just this light in the powder room. BUT...this morning we learned that the sinks finally arrived at the granite shop yesterday, so our counters can finally get into the queue for fabrication. (The master bath sinks are still on backorder (not surprising -- they're so fabulous that our friends Wayne and Judith chose the same ones for their recent bath remodel), but since they're not undermounts, the granite folks can cut the holes without having them on-site.) We expect to sign off on the final details tomorrow, and hopefully the counters will be in soon. Thing I'm Looking Forward To #1: A dishwasher designed by a person who is familiar with the concept of dishes. The designer of our current dishwasher was obviously from a culture that doesn't use 'em. It's the usual size but configured in such a way that we can fit, like, four dishes in it at a time. The same one is in the great room -- where it looks, you know, great. Steve picked out most of the fans, and his modern approach to the fans inspired me to follow in his footsteps for the others. I loved this light the minute I saw it. 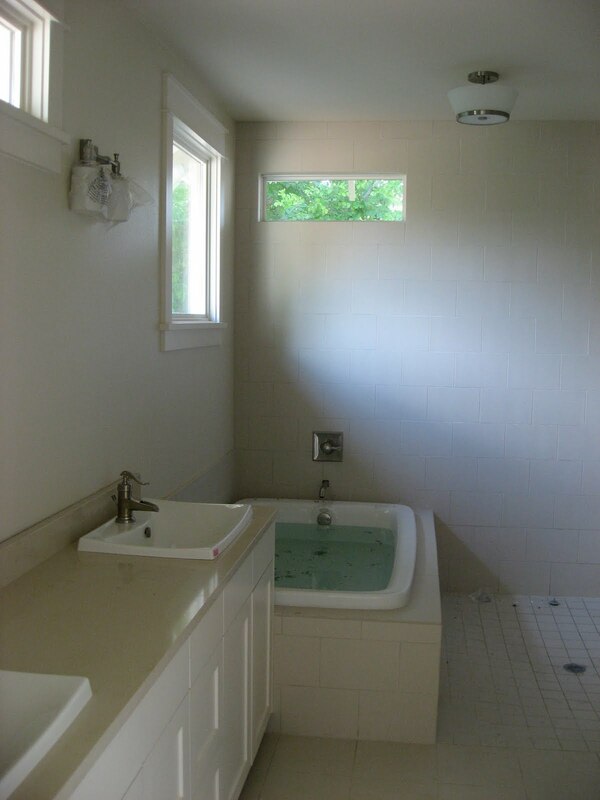 We were going in two different directions with the master bathroom -- very squarish elements with very round elements -- and I immediately knew that two of these would be just the thing to bridge that divide. 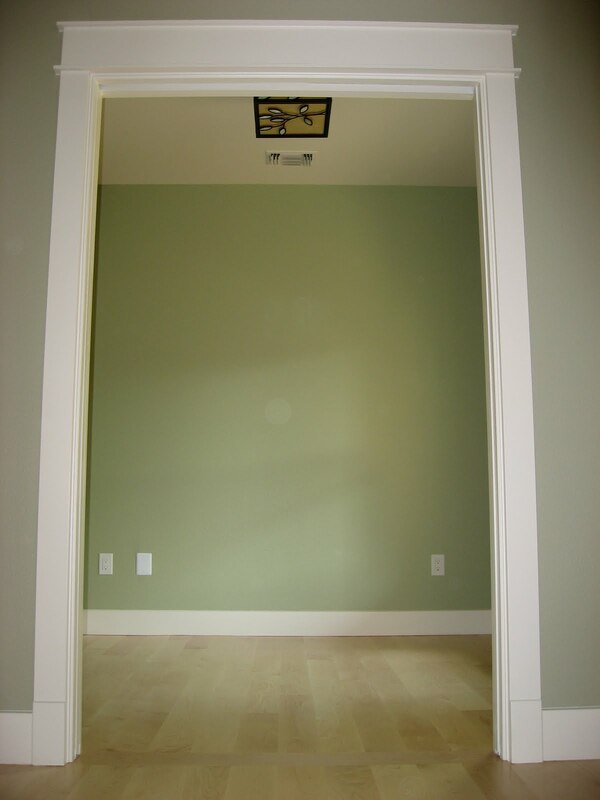 We had originally picked out the 3-light version of these before realizing that they wouldn't work with the window trim, but fortunately we were able to change to the 2-light at the last minute before placing the lighting order. 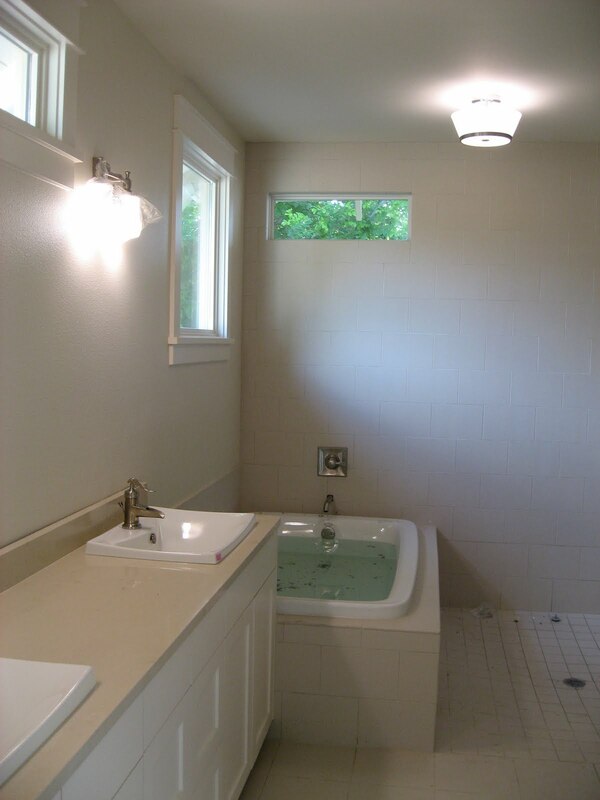 Here's the "cupcake light" that we put above the shower -- clearly, one of the round features. The radiant floor heat control went in just in time for temperatures in the 90s. I'm sure Steve will be itching to crank it up on the first even vaguely cool-ish day this fall. And now on to the ugly side of the house -- the garage storage room, and specifically the water heater. 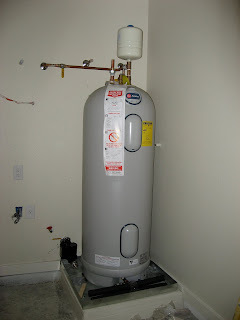 This is a 50-gallon Rheem Marathon, the Cadillac of electric water heaters. We'll take a closer look at the water heater and its green tie-ins another time. And now to finish on a pretty note. This is the view from the guest cottage, looking back. Unfortunately, the electric pole and lines are very visible (although the temporary pole on the right side will be gone soon), but the pomegranate bushes make the view a little nicer, and I'm so glad we were able to keep them. I have discovered that, if properly cared for, they can produce up to 300 pounds of fruit (! 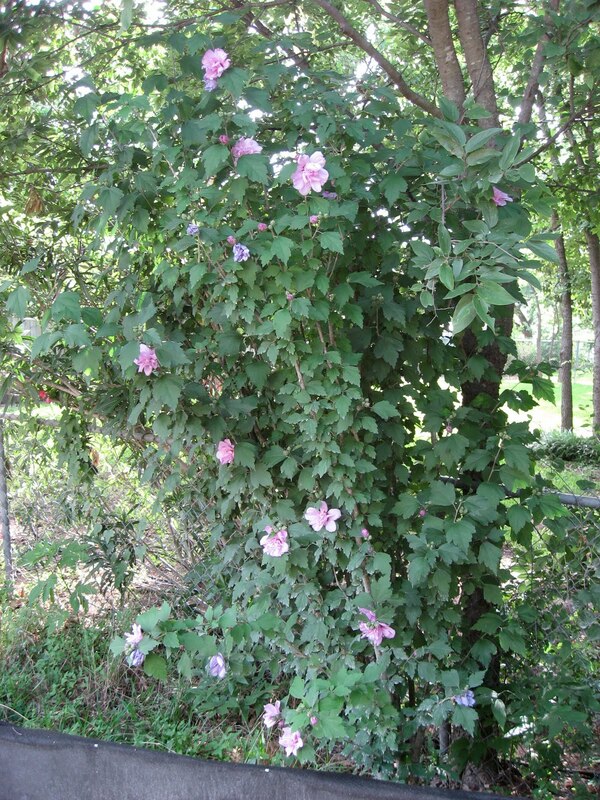 ), but I am going to have to look into whether they can be pruned to be more upright and less bushy. That's a project for next winter.